Atelier Cologne‘s is a fragrant love story: its founders, Sylvie Ganter and Christophe Cervasel, are a couple who share a dream, a passion – and a young family. Atelier Cologne is the first ‘maison de parfum‘ dedicated entirely to that most classic of fragrance forms, the Cologne. 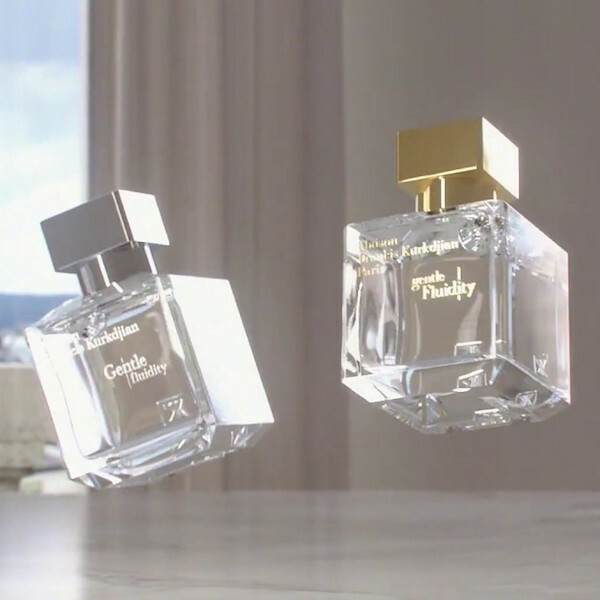 Beyond that, Atelier Cologne heralds the beginning of an entire fragrance category: ‘Cologne absolue‘ – Colognes based around the signature notes of this much-loved fragrance family, but blended to have outstanding lasting power thanks to their very high concentration of perfumed oils (15%). Or Oolong Infini, with elements of black tea, leather, Tunisian neroli, tobacco and woods: ‘His breath fogged the window while he watched new snow fall upon the frozen lake. He came here to catch up on his writing and escape the city. 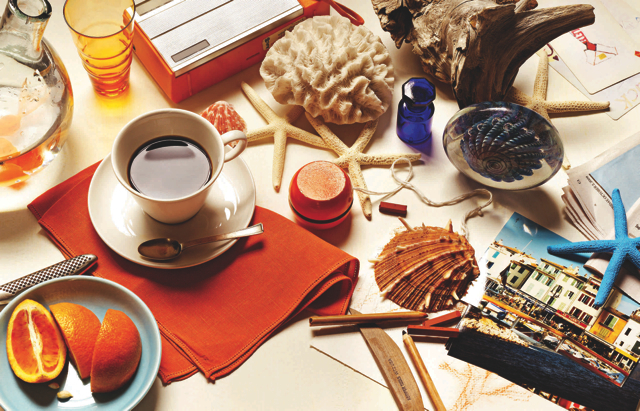 At that moment, the fireplace crackled, ice settled into his glass and his thoughts made their way back to the ink.’ For each, Christophe and Sylvie also assemble a montage of objets, to evoke the fragrance in a photograph, as you can see left. Atelier Cologne have now moved into even more intense, sensual interpretations of Colognes, with the Métal collection (including Camélia Intrépide, Agar Émeraude, Silver Iris, Gold Leather). And 2016’s Orient collection showcases precious and exotic materials like incense, pepper and tobacco. Everything, always, ‘shareable’. Atelier Cologne‘s creations can be explored in perfumeries around the world, but we recommend you also seek out their own intriguing boutiques (in Paris, Nolita, San Francisco, Brooklyn and beyond), which are a world away from marbled beauty halls. 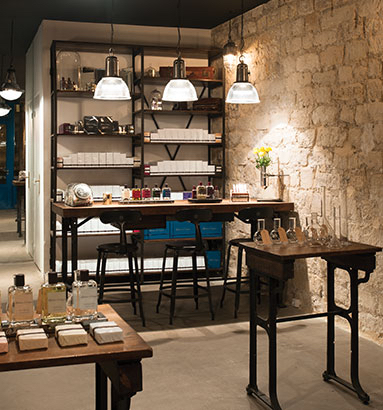 There are many more planned for around the world: furnished in an ‘industrial chic’ style with comfortable armchairs, worktables, stools, they’re a wonderfully relaxed place to explore and enjoy the Colognes Absolues and their stories. 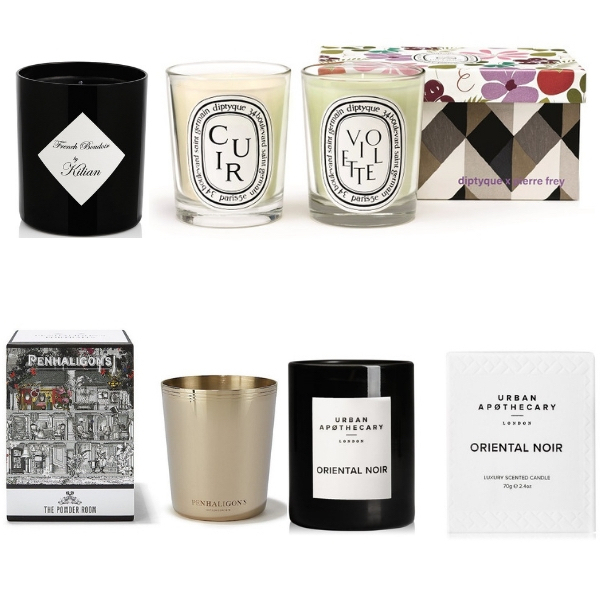 Do check out the exquisite soaps and candles, too – and ultra-exclusive launches, such as Sous Le Toit de Paris, created for the anniversary of Paris’s Galeries Lafayette. A unique feature of the Atelier Cologne boutiques is personalised engraving on leather: each of the boutiques showcases working engraving machines, reclaimed from vintage French and American factories, to personalise the leather travelling cases for flacons right there and then in front of your eyes – with a name, initials, or a special message. A great gift? Absolument…!